Young Dog: Stiffness in back legs? It seems that his reluctance to move up the back steps, frequency in lying down, and the stiffness apparent in his back legs has been concerning me (back legs stiff and shuffles when he walks, which recovers after a bit of walking around). While I intend on taking him to the vet, I was wondering if anyone else has experienced this problem? 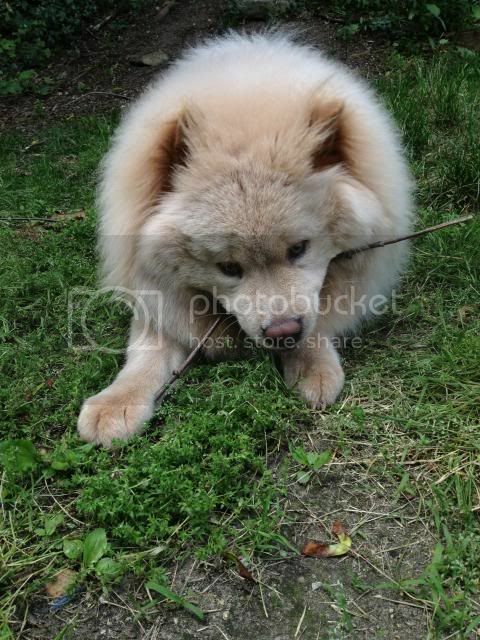 I am concerned because he is a young dog and I have not heard of many common joint problems in a dog so young. My sig other likes to play ball in in the living room, causing Louie to chase after it on high speeds around the couch and possibly slide across the kitchen floor. I'm wondering if this is the reason for the frequency in his stiff legs and need to lye down. So my suspicions lie somewhere in the ball park of joint issues or ligament/sprain issues. Re: Young Dog: Stiffness in back legs? Definitely get him to the vet. It could be a lot of things but hip dysplasia pops into mind because the symptoms you describe remind me of Chloe's symptoms. That is just one possibility though so I'm not trying to freak you out. One piece of advice I learned the hard way is to get X-rays. It is the ONLY accurate way to diagnose HD as well as rule it out. Hopefully your fella has something minor going on. Keep us updated! I think that finding the time to GET him to the vet is my real issue, haha. Looks like I'll have to send my sig other (though wish it was me going with him to the vet). I'll keep anyone who is interested updated. I'll try to get him an apt. sometime this week. 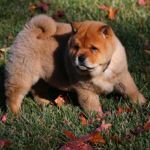 Chows do have a tendency (no pun intended) to suffer ligament and tendon damage in the rear legs. Age of the dog really has no bearing on it, although i have found, through personal experience, that younger dogs are actually more susceptible as they havent fully developed the surrounding muscles. My (now) two year old male tore an ACL at about six months jumping off the couch onto a hardwood floor. He was going full out and of course got no traction on the slippery floor. My 10 month old female injured her knee area running in the yard (we think, no witnesses). 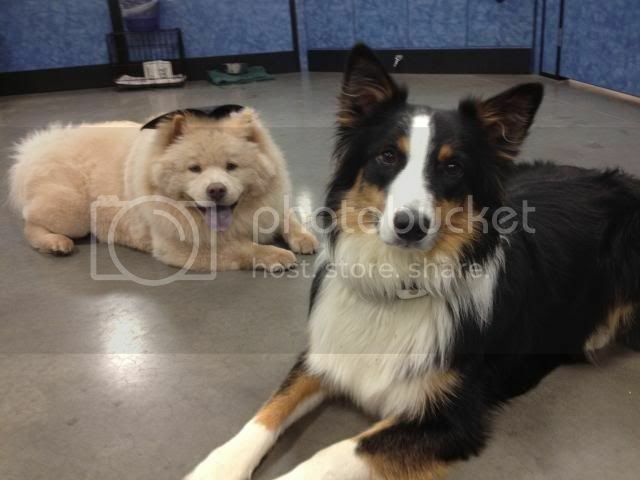 Dogs are from the same breeder but do not share any parentage, so it is not genetic. We had our male to the vet several times for diagnosis. 1st time, they simply twisted and pulled at the leg. 2nd time was X-Ray. Finally, MRI and consultation with a specialist. We were 2 minutes away from committing to the surgery, but decided to see if it would improve on its own, since by this time his limp was sporadic. 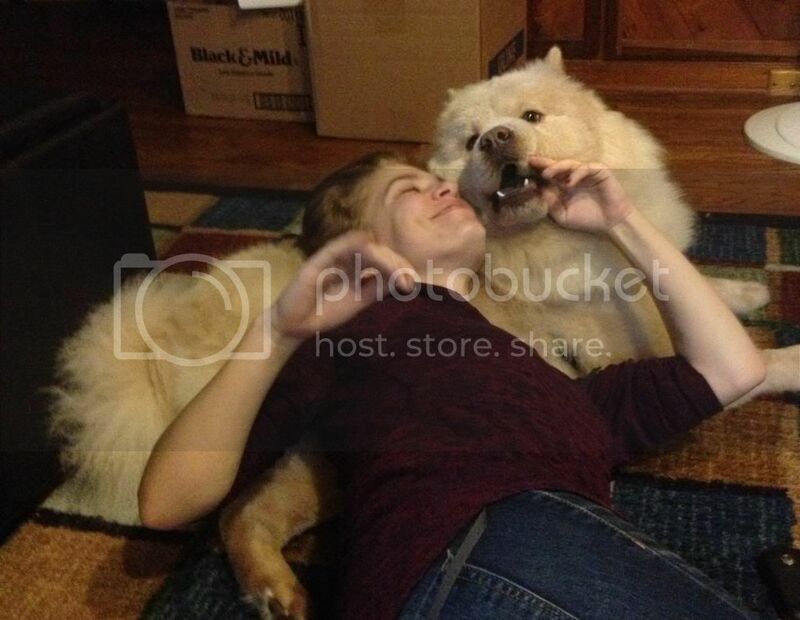 We kept him calm, restricted him from furniture and stairs, and it did improve on its own. We are now taking similar precautions with Amber. Thank you so much for the response Rory's Dad. Louie had his first vet visit today. The vet suspects a joint problem. He shows all of the symptoms, only he wants to rule out congenital reasons. He has given a non steroidal Rimadyl script for 5 days to see if it helps. I have scheduled a separate vet appt with him to perform an anesthetic procedure and xray so they he can determine the degree and location of distress. Here's hoping the Rimadyl helps. The vet appt today was $148 (walk in: $35. 3 year rabie/other necessary shots + *Censored Word* glands + heart worm test, etc: the rest) + 1 year of heartguard: $98. So it came out to $246. I'm just providing this info in case anyone is wondering the ballpark of prices. The vet estimated $183 for the xray/anesthetic procedure. He recommended starting him on a joint supplement. Only, he didn't specify any kind as they are all dependent on how the dog does with a brand (as with ppl and joint supplements). He mentioned that cosequin was a good one, only that it is expensive. 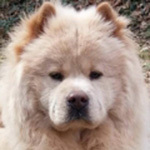 That being said, does anyone use joint supplementation on their chows? And if so, what kind and has it worked for you? Thanks for the update. I use cosequin DS and yes it is expensive IMO. Both my vet and Chloe's surgeon suggested it and when I asked about cheaper alternatives, human grade, etc they held firm that Cosequin was the best and the only one to be tested and proven to have in it what it says it does. I did some research on my own and found that it does appear to be the one used most often. I buy it at Petsmart or order it online. It is cheaper online. Yes, I understand the reputation cosequin has developed =) A lot of customers swear by it. We do sell it at Petsmart, and while I work there, amazon seems to be my go-to ticket if I were to purchase it (or anything nowadays). Ha ha. Rory was on the rimadyl for a 7 day period while we were getting him to try and recover without the surgery. I would say that toward the end of that period it seemed to make a difference, but its hard to tell for sure. We do keep a non-prescription level of glucosomine supplement on hand at all times. In my opinion (AND DO NOT MISTAKE THAT FOR VET ADVICE), it offers similar results. The tough part is getting it into the dogs. I have to cut up the tabs and wrap it in cheese. By the 3rd or 4th section, they figure it out. Chloe took rimadyl and a pain pill after her ACL surgery and suffered no ill effects. I also have some on hand to give her if I feel she is in pain. She had alot of blood work done after the hip dysplasia diagnosis so that we could have a baseline and watch her because apparently all of the pain/anti-inflam meds given to dogs can cause liver damage and other issues when used long term. Right now she maybe gets 1 or 2 a month but in the future she may need daily pain control. So Louie is back from the vet. He had pretty much confirmed our worse fears. 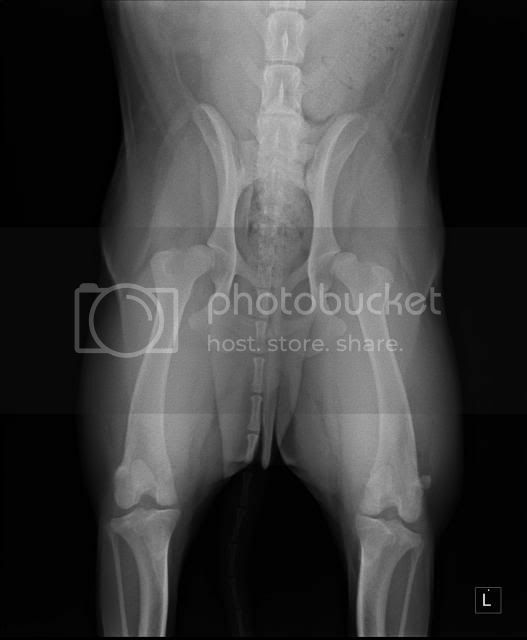 Louie has pretty severe hip dysplasia as displayed on his xrays (we have a copy). While the head of the femurs are formed (though with slight deformity), the entirety of the femur head is not even in the joint socket of the pelvis. The socket of the pelvis is extremely shallow and provides nonexistent support of the femur. Louie will require surgery whenever we decide (and have the money for). Costs range in the $2k-$8k range, depending on the type of surgery. Aside from joint supplements, the vet has recommended water therapy and moderate exercise. Also, no more rough play or ball chases around the house. I am so sorry to hear that it is that severe, hopefully you can get Louie's surgery done before too long. 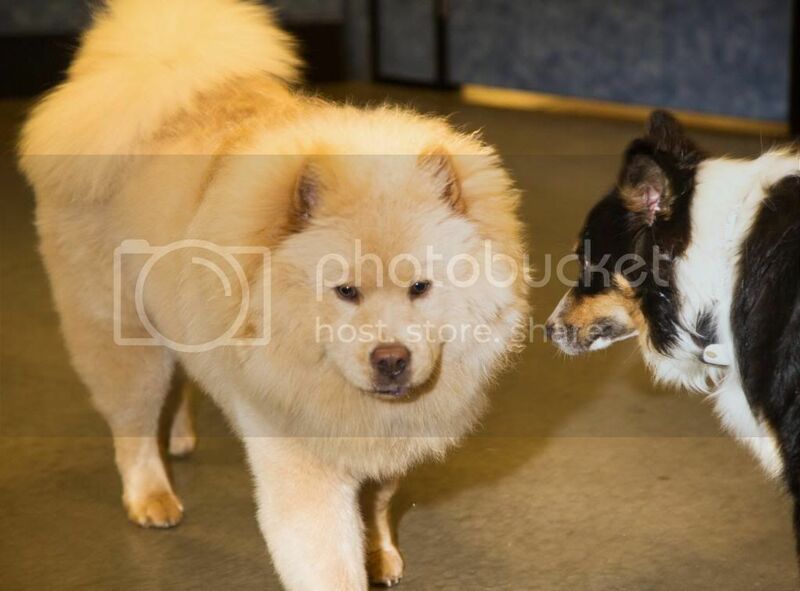 Best of luck telling Louie that he can't run around anymore, not always the best listeners our chows! Please keep us updated on his treatment. Sad to hear of Louie's hip dysplasia...but glad that you found out what the problem is. Hope he can have the surgery sooner rather than later. Sending my best wishes and hugs to Louie and to your human family as well. It's always tough to get this kind of news. Hang in there. Thank you for the support everyone. Here's hoping that our pet insurance will stick by us and help us with his pre-existing condition. This is coming from someone who makes but 13K/year =( on top of rent and other necessary, monthly bills. At least I graduate from college in December... If there ever was a lacking incentive to find a better paying job, I sure as hell have it now. Save save save! But as far as I see it, Louie would have been born anyway and possibly given to a family who wasn't willing to care for him the way I intend. He's our baby, and I love him to death. Even the vet complimented us on how well behaved he is and that he had no issues with him while in his care. For now it will have to be joint supplements, moderate exercise, occasional water therapy (apprx. $70 a session), and pain medication whenever applicable. I am so sorry for the diagnosis and I know all too well what you are going through. Chloe was diagnosed back in the spring with severe hip dysplasia and a month later tore an ACL right as we were finishing building a ramp for her off of our deck so that we could get steps out of her life. Steps are the worst for her so we try to avoid them as much as possible. We built the ramp outside and inside I have a baby gate blocking those stairs. I highly recommend taking your baby to a orthopedic surgeon for a second opinion. They are much wiser and they deal with this all day everyday and it is one of their specialties. Just like if you had cancer you would go see an oncologist rather than just an MD. My vet actually referred me to our surgeon and I found there were differing opinions on treatment. My surgeon is very informative but direct and to the point. He doesn't want her on meds and he said surgery would most likely be far off. He says ignore the X-rays and pay attention to the dog. She will tell us when she needs pain medicine and when she will reach a point that surgery is the only option. He actually calmed me down. I thought we had to have surgery now and that her lifespan would be way shorter and I was a basket case. I was also told that swimming or water treadmill therapy would be great for her as well as shorter but more frequent walks. Also he said the biggest thing is weight loss. He wants her really skinny which we are struggling with but it is hugely important to take stress off her joints. The surgeon charged $100.00 to walk in the door but that covers all future office visits related to the dysplasia. We are fortunate to have a well thought of vet school here in my state and the practice is made up of former professors and pioneers in orthopedic surgeries so I trust them. As far as surgeries Chloe is 6 so it seems FHO and total hip replacement are her only options if/when we reach that point. Total hip is about 10 grand for both hips but is subject to tons of complications and potential problems and is only performed at larger vet universities. FHO seems very drastic and scary but from my research seems successful so I would consider it first when I have to choose for Chloe. I also took her to a vet who specializes in rehab therapy and it was about $50 to get her advice on exercise, water therapy, and info on other things like adequin injections and laser therapy. For now I just watch her and wait. (and worry) She takes cosequin, fish oil, and duralactin and I have rimadyl and tramadol on hand for days she limps or I feel she is in pain. So take a breath, do your own research and please speak with an orthopedic specialist in your area. I'm sorry you are facing this and trust me I know how heart breaking and scary it is. PS: watch those acl's! That surgery is expensive with a worse and longer recovery than some of the hip surgeries and it is common with dysplasia. He is gorgeous! Bless his heart!!! Our vet is only capable of performing FHO surgery and also recommends them to complete hip replacements. He also suggests that surgery is only applicable when and if we feel surgery is his only option. I guess we too will have to wait and see and hit that mile marker when and if it arises. For now we will look into the water therapy for sure and increase his walks while decreasing his length of walks. Fortunately, we live in a one level house with but 5 stairs at the back of the house (but unfortunately we cannot build a ramp as it is a rental). We've started Louie on PetNaturals Hip & Joint chewables for large breed dogs. It contains the necessary fish oil for absorption and he is already on a Salmon and Sweet Potato diet. He also receives the Nupro powder supplement. Sad to hear the diagnosis, but thankful the Louie has such great people around him. I think you are correct in considering management before surgery. Please keep us updated on the progress. 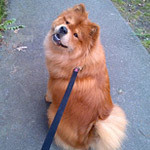 Hopefully the management process helps, i have had some experience with letting nature take its course on ACL and Knee issues, but never hips until much later in my Chows life. So I've uploaded his x-ray (severe hip dysplasia) from the veterinarian if anyone is interested. I'm feeling discouraged as of late. I almost feel like Louie has regressed starting from October to now (November 3). 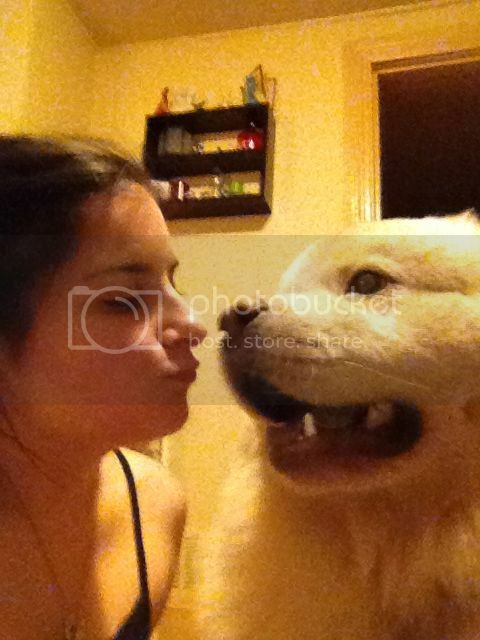 Just this night, Louie was laying in the kitchen whimpering occasionally. So I picked him up and brought him into the living room with me. Thank you Laura and Rory's Dad for the support so far. Somehow, I am feeling a little alone with dealing with this. My family on my father's side have never been animal people and I feel like they just cannot and will not ever understand what I am feeling right now. Awwww I'm sorry! I know it's tough and I also know that a lot of people just "don't get it"! We're here for you so please feel free to vent and share. I worry everyday about Chloe and because they can't talk and tell us when they hurt or what they need, it's so frustrating. Consider that 5 steps really isn't so bad. In managing his condition, you probably will need to forego ball throwing and rock climbing. Considering that most chows really don't mind a lazy life of leisure, he can still be a fairly comfortable and content Chow. I do think it will be an issue in his later years, but for now he can still function fairly normally, if just a bit more relaxed than most young chows. As i mentioned, our 2 year old male ripped out a knee in his puppy days. We managed that without surgery he only limps now for attention and he is definitely playing it up. Rory is 6 pts shy of attaining his AKC CH Designation. I mention this because we picked him from amongst his litter mates based SOLELY on his personality. 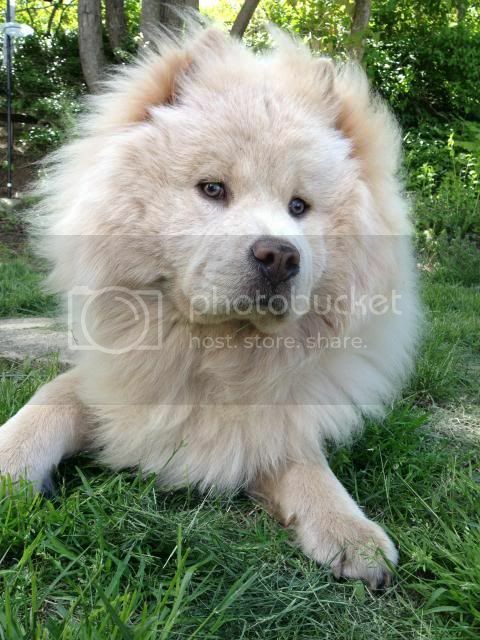 He is the sweetest, most well behaved chow i have ever seen. He also has a pretty darned cute face...lol. The rest of the Chow show world in our area have really rallied around him to build shows that allow are helping his campaign. 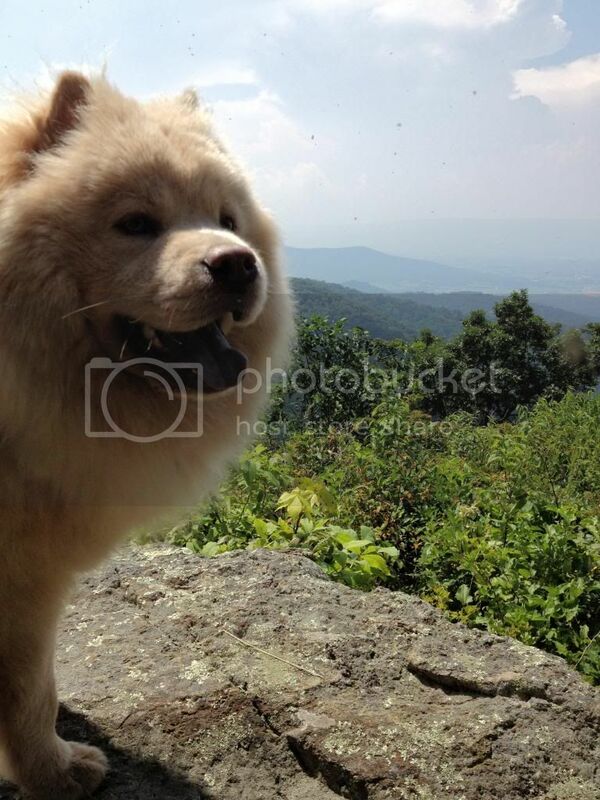 One of the top Chow handlers in the US actually told us that he deserved it. So onto Amber. She too is sweet, and i will take full credit for developing her personality. She was a tough puppy and a chewer. She would snap at being cuddled, and resisted attention. She still chases Rory around and bites at his tail, but he tolerates her anyway. SHE was the breeders choice of the litter and recommended to us (same breeder, different lineage). I am worried about her hips. She is 11 months old and has probably torn her knee out. She has a slight toe out and it just seems to me her hips dont align right. She has won 1 pt toward a CH, but i think we are going to resign her to being a nicely mannered member of the family. Sadly, its just very hard to tell what you have as a small pup. Best of intentions and good heritage doesnt always work so well. Anyway, with any luck you can manage how your dog goes forward. I think its a plus that your vet considers surgical procedures an extreme measure rather than a 1st choice. Based on that i would think that they feel its reasonable to try to manage the dog's activities. After the holidays, we are planning to meet with an orthopedic dog surgeon to devise a more clear cut plan as far as maintaining the problem is concerned. At least this way we will know how to properly maintain the issue (I personally am always better with routine) and keep him comfortable for the long term. Judging from the x-ray, it appears that his joint, particularly his left socket and femur, are nearly out of the socket already... I had a friend of mine who is a vet take a look at it and she agrees also that surgery will eventually be an only option if the joint is already to this degree at such a young age. I've contacted my pet plan insurance and they have confirmed that they will cover the congenital problem (because it was diagnosed AFTER the plan had been created a year ago) and will reimburse us anything up to $10k for any surgery plans. This in itself is a burden lifter! We are also looking into water therapy (for exercise) and acupuncture (for inflammation). gluesticks wrote: I've contacted my pet plan insurance and they have confirmed that they will cover the congenital problem (because it was diagnosed AFTER the plan had been created a year ago) and will reimburse us anything up to $10k for any surgery plans. This in itself is a burden lifter! That's great news! Would you mind sharing the name of the insurance company? I agree with Drew that it would be helpful to know about companies that stand behind their coverage. Many pet insurance companies will deny coverage for defects. It's all in the contract, but many times its in 3 pt type and our Chows can't read that small print. I understand the overprotective thing. After our experiences with knees, and my concern with Amber's hips, i watch every step, slip, and stair they take. I have come to the point where i look for the worst. Alrighty. I have had Louie on a hip+joint supplement called Pet Naturals by Vermont (chewables) and they seem to have brought his energy level back up to speed after a month of use, he seems less reluctant to go up the back steps, and more importantly less stiffness in his back legs. Would def recommend these supplements =) I've also changed his food a couple of months ago, which has some joint supplementation. Recently, Louie has been chewing on his tail (particularly the base and a little up). He'll be walking, and then all of a sudden he sits down and arches back to chew at it like it suddenly itches. He started this about 3-4 weeks ago. He does not have fleas, and I have checked the area for ticks. No ticks. I did notice 2 dime sized scabs along the tail, and some irritated skin (and a possible sore). Not sure if this newly developed behavior has been developed by his hip pain (redirected pain relief?) or may be something else. Last edited by gluesticks on Sun Dec 08, 2013 3:32 pm, edited 1 time in total.